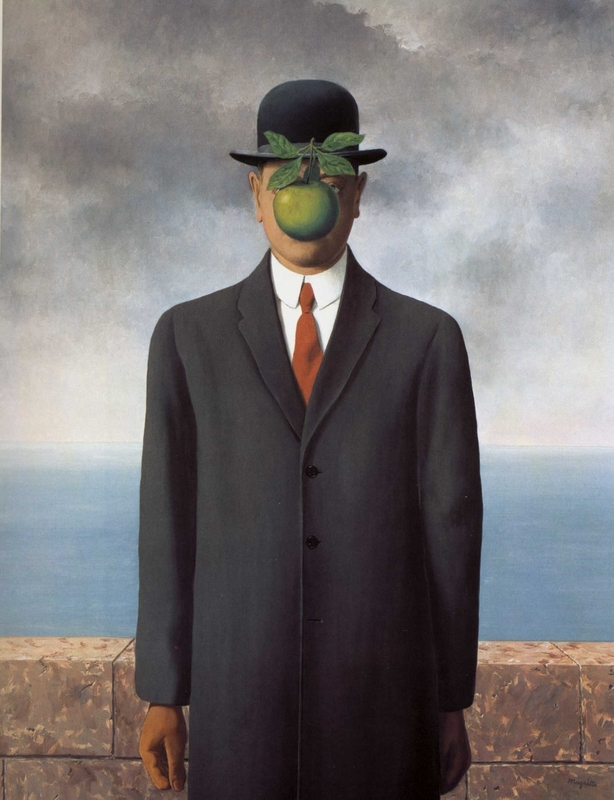 In discussing Buddhism and the subjectivity of perspective, one of my students mentioned Magritte’s Son of Man, the famous painting of an apple concealing a man’s face. The apple, an object we desire, conceals the subject, the idea that lies behind this painting. Reality appears to us as simply there, bare and objective, which conceals that our reality is also our own individual perspective, which we learn through investigation and reflection. Much of human experience and the history of philosophy across the globe is concerned with either separating the objective from the subjective or describing how the two are intertwined. One couldn’t ask for a more perfect illustration than Magritte’s painting, whose title suggests that this has been the simple problem in the faces of all the descendants of Adam and Eve ever since the apple. Magritte’s Son of Man subjectivity could be compared to Nietzche’s subjectivity and more specifically Schoppenhauer’s, Heidegger’s and Sartre’s for an interesting paper. Loved it. It could indeed. Thanks for that!